DMT® Diafold Magna-Guide™ sharpening system. The Double Sided Diafold Sharpener offers portable, two-stone sharpening at its best, the Aligner Blade Guide (ABG) provides 7-Angle adjustability for the right edge every time, and the MAG - Magnetic Angle Guide joins the two! The Double Sided Diafold Sharpener offers two 4" x 1" Diamond Whetstone surfaces in one lightweight, portable sharpener. Convenient size: 9 1/2" open. 5" closed. Folding plastic handles protect sharpener when not in use. 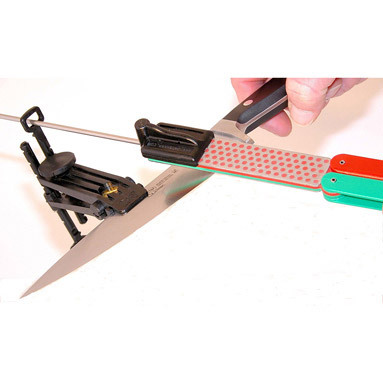 Both novice and professional will appreciate the ABG to create precise, professional, consistent sharpening results, Accommodates wider blades as well as standard blade thicknesses. No messy oils needed-sharpen dry or with water. For proper tool maintenance, woodworkers, chefs and other professionals rely on the superior quality and versatility of DMT products.